Note: This is the third and last chapter of Part 1 (The Architecture of Capital), after this I will move into the political economy of architecture and the analysis of the case studies. We have already introduced the general character of human labour in Chapter 1, now we need to develop more in detail its relation to the concept of object as it has been specifically defined in the previous chapter. However, first we need to examine objects –and the labour which uses and produces them– from the standpoint of biological processes in both the world of perceptions and the world of actions as defined by Uexküll. The sensations we perceive from stimuli coming from things existing in the outside world are not really properties of them, hence, sensations belong to the subject and lack spatial extension. This is what Uexküll concludes from his biological understanding of what makes an experience of the world, which is heavily grounded on Kant’s conception of the subject-object relationship (Uexküll 1957, 13). 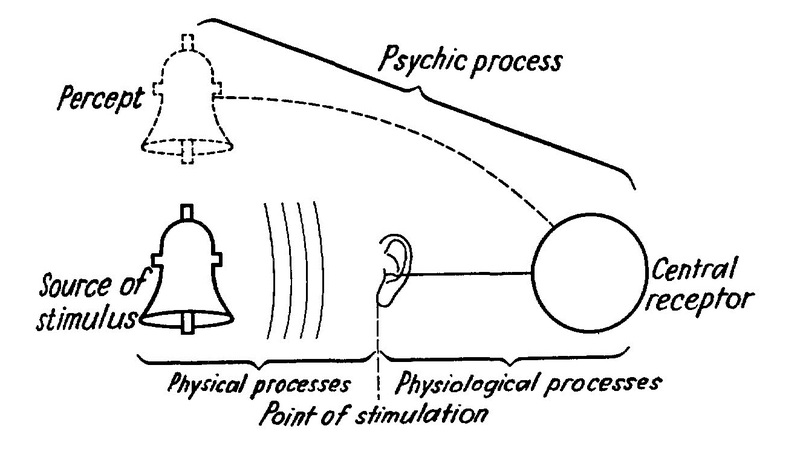 For example, says Uexküll, if we hear the sound of a bell far away, this is nothing more than a sequence of processes: a physical process in which the air waves penetrate our ears, a physiological process in which these are transformed by the eardrum into nervous excitation and transmitted to the brain, and finally a psychic process when the receptor cells project a perceptual cue into the Umwelt –in this case a sound sensation– making it appear as a property of the bell itself (1957, 63). As already stated, this process is called sensory circle since it describes a path from the external to the internal world of the animal and back to the external, forming the subject’s perceptual world (Merkwelt). Each sensory circle corresponds to one sense organ, but in combination they are responsible for the concrete image of our world. Uexküll brought this study to its limit asking which part of the experience belongs to the subject and which to the object (n. d., 13), concluding that an animal cannot perceive anything outside the reach of its own Umwelt –which brings him closer to Kant’s notion of the thing-in-itself (Uexküll n. d., 70; 1957, 13). Some authors have seen the Umwelt concept as hardly distinguishable from solipsism (Weber 2004, 300), whereas others have emphasised the distinction between them, arguing that Uexküll never denies the existence of the external world, but he criticises mechanistic scientific objectivism as having forgot the crucial role the subject plays in any experience of the world (Rüting 2004, 49). The sensory circle provides the content of our experiences: these are content sensations and are distinguished by their quality and intensity (Uexküll n. d., 29-30). 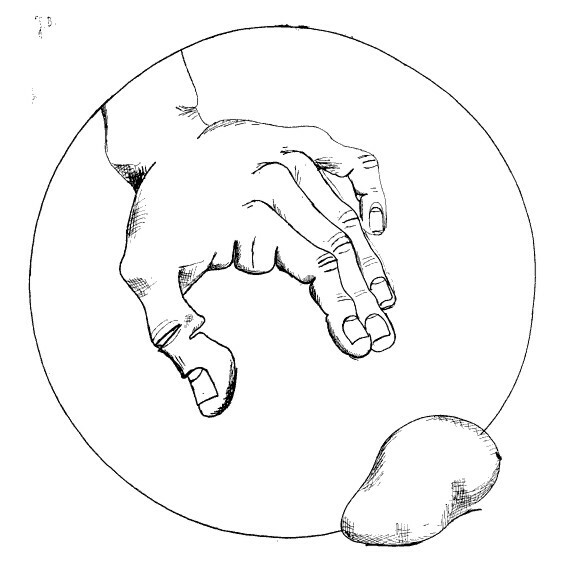 This circle, however, only consists in ‘half’ of the biological process described by Uexküll. For if the result of this is a passive sensory perception –a ‘natural’ thing– there must be another process by which the subject engages actively with his world. A simple example would be if we suddenly look directly at the sun or if an object is fast approaching our eyes, in both cases we might blink repeatedly or even cover our eyes with our hand or forearm. This is called a reflex act, and the process by which the sense organs relate to the organs of action so as to provoke a bodily response is called reflex arc (Uexküll n. d., 12-13). But only a small part of our actions can be considered involuntary reflexes, whereas the rest result from more complex processes. Another circle has to be considered, through which our effector organs (effector cells, muscles, glandules) react to a different kind of stimuli that our brain convert into impulses. If the sensory circle allows us to form a perpetual world that we furnish with things –along with their qualities and intensities–, the impulses circle enables us to form an effector world (Wirkwelt) which we endow with objects representing potential actions. Merkwelt and Wirkwelt form a closed subject-object unit or, as mentioned earlier, the Umwelt (Uexküll n. d., 68). Now, we have said that objects differ from things in that they elicit our actions. All things can be turned into an object if they articulate with us in such a way that they provoke a unitary action from our part –i.e. a regulated action (Uexküll n. d., 64). If things are recognised by the content sensations we project onto them, objects are distinguished by order sensations. Unlike the former, these are discerned solely by their quality and not by intensity, namely: location, direction, and moment (Uexküll n. d., 30). They ‘serve only for ordering the sensations that arise in experience’ (Uexküll n. d., 30) and never present themselves in isolation but in permanent connection with content sensations which ‘wrap’ them with sensory properties. We also held that the object is at once concrete and abstract –i.e. a tangible and useful man-made thing and a mental scheme enacted by internal effector organs. Our sense of location, for example, is responsible for giving objects their concrete figure. This must not be confused with its sensory appearance as coming from content sensations, but rather it is a spatial structure constituted by a ‘given relationship of places in space’ (Uexküll n. d., 55). On the other hand, our sense of direction forms the abstract properties of objects, for every figure must be grounded on an elemental scheme composed of direction signs, such as upward/downward, forward/backward. These elementary directions have no shape and form the basic units with which we configure rules of movement that are kept in our memory, ready to their use. Uexküll is emphatic in stressing the importance of these abstract schemes of movement: ‘Without scheme there is no object, as there is no melody without rhythm’ (n. d., 56). Time sensations are considerably simpler than the previuos ones. Just like space, our sense of time provides the ‘stage’ for our experiences, therefore ‘any content sensation, wherever present, is always linked to a moment sensation which indicates the point where it has to be placed in the series of time’ (Uexküll n. d., 31). 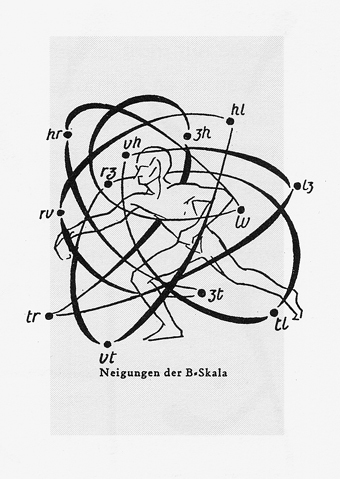 Following the experiments of Estonian Biologist Karl Ernst von Baer, Uexküll regarded the moment as the ‘smallest indivisible time vessel’ (Uexküll 1957, 29) which repeats ceaselessly in the successive chain of time. Von Baer fixed the human moment in about 1/18 of a second, and this establishes the measure under which we are able to perceive movements and distinguish if something ‘was’ (before), ‘is’ (now), or ‘will be’ (after). Any slower or faster movement will not be perceived as such, for example, when we look at clock hands or when we look at the spokes of a bicycle in motion (Borchers 1975, 212). 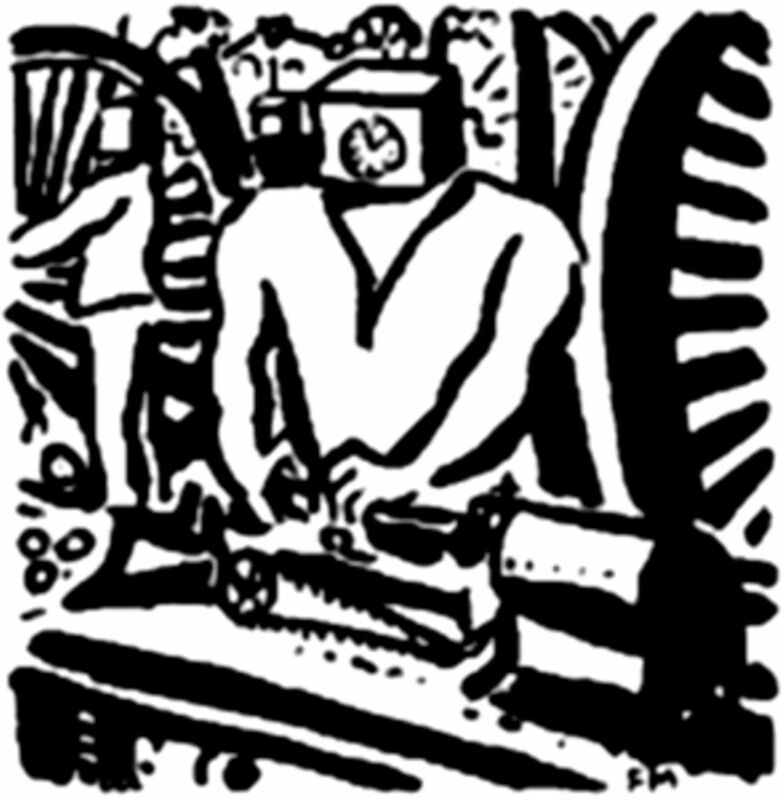 As both Uexküll and Van der Laan –and certainly Marx– acknowledged, labour is an activity that arises out of the necessity to ‘complete’ nature in order to dwell in it (Uexküll n. d., 112; Van der Laan 1983, 1). After immediate needs are satisfied, man has to move beyond the production of means of subsistence to producing his own means of production. Hence, tools are the first product of labour which is also used as an instrument for it –a conductor of man’s activity (Marx 2011, 199). In the previous chapter we discussed this twofold character of objects: for one part they are the result of labour, for another they are conditions for it. It is this latter property that interests us since it has an ‘operational’ relevance. We can even regard all objects as being instruments of some sort, on account of their ‘equimentality’ (Heidegger 2001, 97). Labour can be understood, then, as an activity whereby (natural) things are transformed into (artificial) objects, and in which these latter, as being also conditions or tools for further labour, embody the ‘operations’ necessary for their productive use. Understood in this way, objects must pre-exist in our cerebral and bodily memory in order to be properly effected during the labour-process. Yet, this must not be regarded as a concrete image, but as a set of rules or directions, which activate as soon as we ‘see’ a potential action in things. 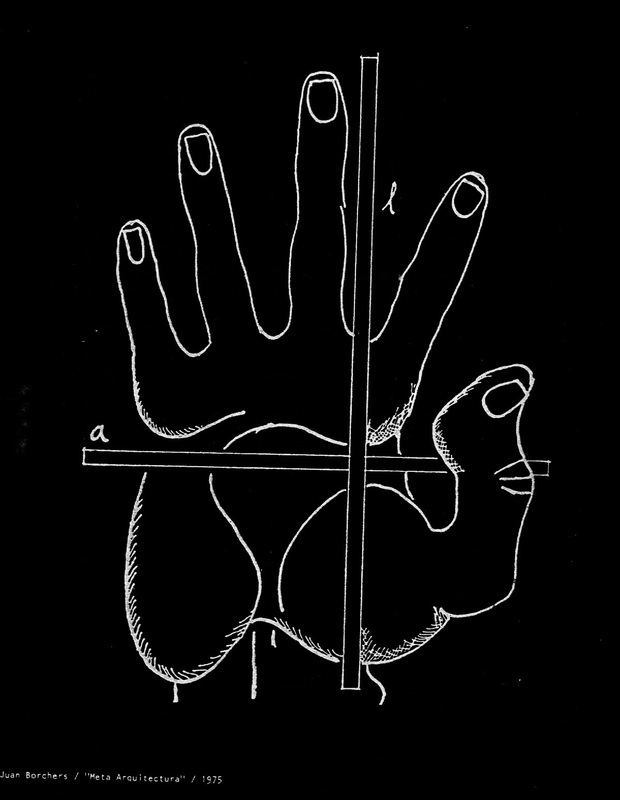 The fact that objects cannot be perceived directly through our sensory apparatus led Uexküll to examine by which process our internal organs get stimulated, so he put forward the notion of a threefold human space: tactile, visual, and operational. In tactile space we project local signs into the external world, forming a sort of place-mosaic. In visual space, these local signs coincide with the visual elements of the retina, forming a mesh which wraps all things, and on which depends the sharpness and detail of our visual image (Uexküll 1957, 19-20). Accordingly with the peculiar distribution of our tactile organ (skin), when we project sensory units outside, these form an ‘extension’ which surrounds us entirely, like a soap bubble full of local signs (Uexküll n. d., 43-44). Thus, our internal sense of location gets activated through two external senses, touch and sight, and in that way it is associated with the concrete side of objects –i.e. their ‘figure’ composed by numerous localities. The links between each local sign on the tactile and visual place-mosaic are made through operational space. In it, we perform our daily movements which follow directional steps according to the six basic directions mentioned in Chapter 1, and that we can recognise through propioception or kinaesthesia which acts as direction signs (Uexküll 1957, 14). 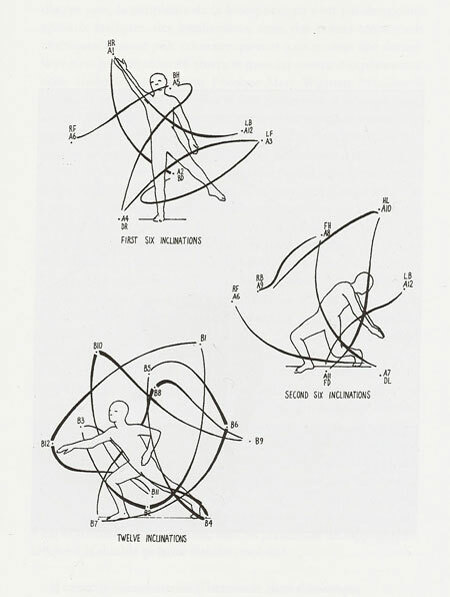 The sense of direction organises these into three planes intersected perpendicularly to each other, forming a coordinate system centred in the head (Uexküll 1957, 15). Directional steps are responsible for linking together all local signs in our ‘extension’ and also for guiding our motions. The stimuli affecting the impulses circle comes not from natural things, but from objects of our own creation which bear the mark of direction signs we imprint onto them. This correlation may lead us to understand the architectural work as the result of a large scale ‘motor reaction’. When we receive external stimuli coming from things, we instantly mark them with receptor cues (perceptual meaning), closing the sensory circle. Conversely, when we receive internal stimuli coming from our own body –as it relates with sensations from the ‘first circle’– we mark things with effector cues (operational meaning), closing the impulses circle by transforming them into objects. The joining together of the two is called functional circle (Uexküll 1957, 9-10; n. d., 68) and describes the actions we perform as consequence of having a perceptual experience of the world. This is the continuous activity of production which humans inevitably have to carry out in order to make a livelihood. We can consider human labour then as a particular form of the functional circle. Let us remember how Marx described it as a ‘metabolic’ relation with nature. What is at stake then, in the functional circle, if not a relation of this kind? We can easily see that labour takes place primarily within operational space as a set of instructions guided by directional steps. Therefore, the twofold nature of the functional circle –its perceptual and motor aspects– must be regarded as the biological basis of all productive activity, and it is in that sense that the production of the architectural work can be understood as a ‘chemical reaction of grandiose proportions’ (Borchers 1975, 10). Looked at from this standpoint, objects will appear not just as the material result of productive activity, but also as a projection of the socially coordinated actions of labour. So far, we have considered –from the biological standpoint– the subject-object relationship in great detail. At this point it is necessary for us to move onto the analysis of social relations implied in it. This will be done to counterbalance the lack of such realm in Uexküll’s evident phenomenological approach. For if some have labelled his subjective turn in biology as largely Neo-Kantian in character, others have noticed the ‘contextual’ influence of his contemporaries Husserl and Frege (Chang 2004, 116, 119). Regarding objects as concrete embodiments of many useful qualities, they are the product of a seemingly never-ending variety of types of labour. For Marx, use-values must be, accordingly, the products of useful labour –i.e. of ‘productive activity of a definite kind and exercised with a definite aim’ (Marx 2011, 49). The heterogeneity of concrete and useful labour corresponds to that of objects, so carpentry, tailoring, weaving, building, and so on, produce chairs, coats, linen, buildings: ‘what appears objectively as diversity of the use-values, appears, when looked at dynamically, as diversity of the activities which produce those use-values’ (Marx 1859, 7). But one and the same activity can produce many different kinds of objects. A carpenter can produce chairs, beds, or tables; a builder can build houses, factories, schools, and so forth. This is what Marx refers to as the ‘social division of labour’ –which we will discuss in the next chapter– as the heterogeneous totality of different forms of useful labour performed separately, and that constitutes the basic condition for commodity production (Marx 2011, 49; Mohun 2001, 153-154). According to Jameson, it is concrete labour and its particular branches and products that Marx regards as the realm of quality which is linked directly to the body in its phenomenological dimension: ‘Use value is therefore quality; it is the life of the body, of existential or phenomenological experience, of the consumption of physical products, but also the very texture of physical work and physical time’ (Jameson 2011, 19). As mentioned before, use and values-in-use (concrete objects) are by nature contingent, particular, and qualitative. We have seen as well, how objects cannot be reduced to a bundle of its sensuous qualities or ‘accidents’ as Harman (2011, 24) rightly reflects upon Husserl’s concept of Abschattungen. Yet, although objects are less than these sensory properties, they cannot exist without them. We will return to this phenomenological question on the object, but first we need to deepen our understanding of the process of abstraction of concrete labour via the abstract side of objects. Coordinated actions with a definite aim become ‘embodied’ in the object produced, but as we saw earlier both actions and result must pre-exist in the mind of the worker. However, the resulting object is far from ‘static’, for it must serve subsequent actions that will consume it; furthermore, it can also serve this purpose by re-entering the production process as means or tool. The structure of these actions must be signalled on the object. Both of these purposes make objects values-in-use, and in that respect they are defined by the particular conditions and aims with which they are produced –they are concrete useful objects resulting from concrete useful labour. But if objects are produced for being exchanged with other objects, the only thing that matters is the quantity of average labour-power needed for their production, so they can be compared with each other. Paradoxically, the labour-time –and the actions carried on within that time– that measures that quantity is regulated by the products of that very same labour –namely, by their value relation (Marx 2011, 86). They are, therefore, abstract social objects resulting from equally abstract social labour. The uncanny nature of Marx’s definition of value resides in its ‘immaterial-yet-socially-objective’ character: for commodities to have value means that they count only as ‘homogeneous congelations of undifferentiated labour’ (Marx 2011, 52). Marx used terms like ‘congelation’, ‘crystallisation’, and ‘objectification’ alternately to illustrate how concrete labour and its product become abstracted as values in commodity exchange, and how this is ‘not some purely subjective illusion or individual whim but rather a social fact, a social reality we neglect at our peril’ (Jameson 2011, 26). The labour-value embodied in commodities, then, has a purely social existence, stripped away from any particular quality. Here, the object counts only as the underlying time-structure of the activity of labour and not as a material useful thing. Thus, the object is no longer a concrete chair, but a set of instructions distended in time, and indispensable to build any chair in a definite amount of time, this latter ultimately determined by what society requires as ‘socially necessary’. Moreover, as abstract object, the chair also represents a set of instructions to use it –whether productively (means of production) or unproductively (means of subsistence). What sorts of actions then, determine the nature of these objects? The problem we face now is how to specify the kinds of actions carried out during the labour-process, and what is their relation to architectural objects. For our comparative analysis of the theories of Uexküll and Marx raises the question, once again, of the universal and the particular. The biological and phenomenal approach of the functional circle is clearly a universal process, common to all human beings. But it is also a concrete phenomenal engagement between a subject and its object. Similarly, the social premise of value implies both, a concrete production process, and an abstract homogenisation of all qualitative differences among labour activities. Hence, not only objects are imprisoned between these two poles, but also the actions they entail. In the following, I will suggest that it might be that objects, on account of their abstractness, are the crucial terrain where commodification has taken place on a spatial level with the advent of capitalism. 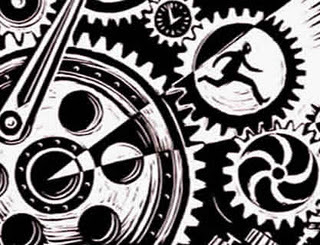 Labour-time is a quantative magnitude, and as such, completely non-spatial, just as the sensations we form in our brain and project onto external objects. When performing labour, human actions are as varied as the social division of labour. During this process, actions must be planned in advance and performed in a coordinated way which assures the realisation of the purpose intended from the beginning, for man ‘not only effects a change of form in the material on which he works, but he also realises a purpose of his own that gives the law to his modus operandi, and to which he must subordinate his will’ (Marx 2011, 198). Hence, actions are regulated by our will. Free and spontaneous movements are subjected then, to a temporal-directional structure of rules and instructions laid beforehand. We can even suggest that this is the case not only in the labour-process, but in society as a whole. Just like the rules in sports and games, for example, human activities are regulated by social objects, which are embodied in all things that have value-in-use for us. This social structure of activity underlies, therefore, all human motions, labour being the most evident and relevant case. There is one concept within architectural theory that could explain how things turn into objects, and how these in turn regulate our actions: the concept of human act. Unfortunately so far, it has been scarcely formulated, but we can hopefully trace it back and reconstruct some relevant contributions. Put in simple terms, a human act is ‘the abstract structure of action’ (De la Cruz 2000, 139). In contrast to notions like use, action, activity, and function, I will suggest that human acts have an abstract and substantial character in architecture. Thus, we need first to sharply distinguish this concept from these apparently similar notions. As we know these were developed within the Modern Movement, and represented an attempt to find the objective basis of architecture. Nevertheless, according to Lefebvre (1991, 144, 273, 369) and Adorno (1997), for instance, function was merely an abstraction from real use, and ultimately served as the basis for the ‘taylorisation’ of architecture. Furthermore, bodily movements and simple actions we perform to use something cannot be regarded as substantial, for they vary according to the concrete situation in which they take place. We can swim in various ways and with diverse techniques, but the act of swimming, along with its basic rules, underlies all those possible variations. The similarities with the concept of object are evident. However, problems arise as soon as we leave behind examples based on institutionalised practices –such as sports– and move towards everyday practices, such as working and dwelling. The act is the simplest unit in architecture; it is the element, such as colour in painting and sound in music. An act contains a number of concatenated impulses that are crystallised actions into things, which are the perceptible bearer of objects. 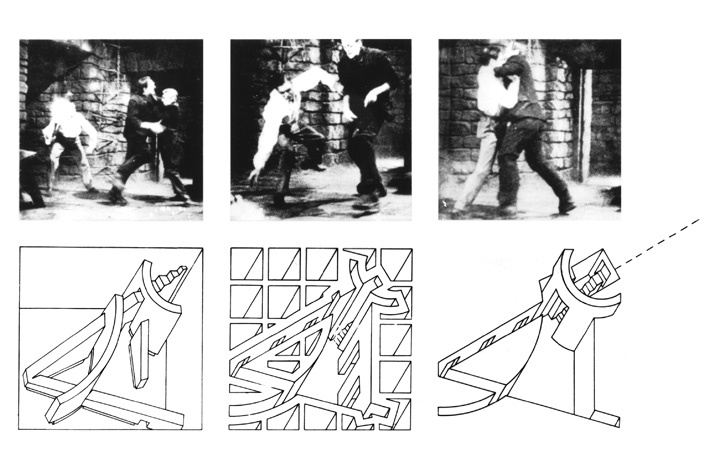 The context of these ideas has to do with Borchers’ attempt to define the specificity of the discipline of architecture, detaching it from others, and leading it towards its autonomy (Borchers 1968, 41, 118-122, 145; Pérez Oyarzun 1997, 11). Through a radical critique of the visual and sensory bias of the Modern Movement, he deemed necessary to identify the specific sense around which architecture should be centred, just like painting is on sight, sculpture on touch, or music on hearing (1968, 101, 118). He was also extremely critical of both the professional practice of architecture and the academia during the 1950s. Consequently, he proposed to base architecture in a new sense: the totality of the human body taken as one great organ (1968, 118, 169), in such a way that architecture could transcend a mere aesthetic organization of sensations (1968, 116). At first, this may seem as an obvious fact, but his proposition grows in complexity: for the entire body to be the foundation of architecture means that the latter has no privileged or specific sense to which appeal. The fact that until that moment nobody had identified this specific sense was one of the reasons why, according to him, architecture was in a confused and undetermined state, paradoxically looking for its own specificity in other fields of knowledge (1968, 101). 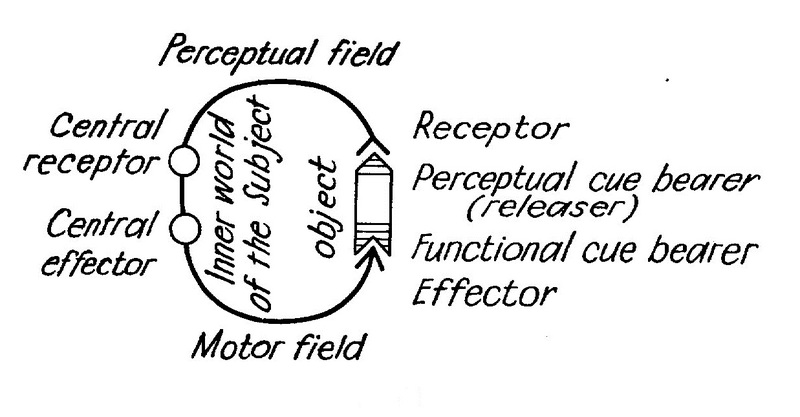 Although the reach and depth of Borchers’ theory exceeds the current exposition, it is important to contextualise –however briefly– his concept of the act, which is grounded on the search for the specific brain organs that are responsible for our perception and bodily responses to the outside world. Uexküll also sought to identify, within the brain, these central organs. He found a central receptor or perception organ (Merkrorgan) capable of unifying the content sensations of the sensory circles to form our Merkwelt. He called it apperception or plastic organ –taking the former from Kant (Uexküll n. d., 57-58). But he never specified that motor part of the brain responsible for giving nexus to order sensations coming from the impulses circles, to form our Wirkwelt. This central effector or action organ (Wirkorgan) he called it will organ, but apart from linking it to a ‘memory organ’ that stores the ‘rules of movement’, he admittedly left it undetermined (n. d., 140). Yet, he did develop a complete biological theory (Uexküll 2010) which served as the basis for later developments in biosemiotics, and in which he acknowledges the central importance of the active responses of man and animal towards the world: ‘Living organisms, especially animals, can perform actions that are not simple effects of particular properties, but that thanks to a uniform constructive plan, are true acts’ (n. d., 65). Borchers took and developed these notions as he saw them as the only way to decant architecture ‘towards its radical base’ (1968, 119). We have mentioned that, for him, abstract objects are the substance of architecture, and we also linked this assertion to the phenomenological approach of Husserl. Following Uexküll then, he defined our will organ as ‘the centre of permanent and spontaneous activity that sets in motion the imperative organs of actions and whose rules are stored in an organ of memory which preserves the rules of movement’ (1968, 120), and impulses as ‘certain suggestions of the will that serve for the execution of definite coordinated movements of the muscles’ (1968, 147). The whole process of the functional circle, which begins with a perception –brought about by the plastic organ– and ends with an action –launched by the will organ– is conceptualised by Borchers as the basis of human acts. But he focuses on the impulses circle and the will organ as he sees a ‘need for grounding architecture as a phenomenon of the will and not as a phenomenon of the senses’ (1968, 118). The particularity of this argument is that by focusing on the will it goes beyond the notion that the architectural work affects us exclusively on a sensual-emotional –and ultimately purely subjective or psychological– level. On the contrary, what implies is that architecture itself is the product of our ‘objectified will’ –our ‘crystallised actions’. Therefore, if human acts constitute the fundamental element with which the architect (as general figure) can constitute its objects –i.e. the architectural work understood as a concatenation of multiple objects– then, they are nothing more than his subjective will put outside of him in the form of ‘congealed actions’. Put it bluntly, acts are ‘crystallisations of the will’ (Borchers 1968, 171); they are the ‘petrified’ structure of the actions that constitutes objects. It is difficult to clearly see the difference between both acts and objects, as Borchers himself use them alternately, but for now I think the point is fairly clear. As we can see, the similarities with Marx’s terminology are at least astonishing. Let me suggest that, in pointing out this parallelism, two distinct definitions of human act emerge: 1) the abstract structure of activity, which underlies and regulates our otherwise ‘spontaneous’ actions –e.g. matrimony / get married; dinner / to eat; labour / to work, and so on. 2) crystallised or immobilised unitary actions, which remain in a ‘latent’ state within concrete objects –e.g. entrance / to enter; corridor / to walk; staircase / go up or downstairs, and so forth. The first definition has basically a social and immaterial character, whereas the second is essentially architectural –though these latter examples must not be understood as material objects, but as elementary temporal and directional signs. In both these cases we can clearly distinguish act from action: the former is always a noun, whereas the latter, a verb. We can now clarify the implications of the theory of the act for the theory of value and vice versa, with the aim of determining the grounds for the relationship between the work of architecture and the development of capital. This latter category has yet to be introduced, since its complexity and historical implications need further elaboration in the next chapters. What are, then, the common aspects of these concepts, one belonging to architecture and the other to social theory and economics? The process of ‘objectification’ seems to be the first shared category. On the one hand, actual labour becomes embodied in commodities thanks to its abstraction into average time units: our concrete practice of making a chair turns into a quantitative measure, its value, so we can sell (exchange) it on the market. On the other hand, real actions become materialised in things which ‘contain’ them as generic objects: our mental scheme of what makes a chair turns into bodily actions that actually build a concrete chair which ‘contains’ that very same general scheme which is common to all particular chairs. As we can see, we have to be careful, for ‘objectification’ plays a different role in each of these examples. On the first, it means that a concrete activity turns into an abstract measure (time) which is social, since it designates a value-for-exchange with other commodities. On the second, it means that a concrete activity turns into an abstract scheme which is also social, but remains in the realm of values-in-use and, therefore, it is ‘activated’ whenever we engage with an object. Consequently, the abstractness of value has no spatial implications in itself: an exchange can occur in any place at any time, nowadays without even requiring physical presence. Conversely, although acts are non-spatial schemes, they always relate to a spatial component: for going downstairs, or walking through a corridor, we only need to know our departure, stop, and arrival points, that is, the connective relations we need for moving about; the spatial figure of the staircase or the corridor are secondary, just like a transit map on which the only thing that counts are the connecting lines regardless the actual form, scale, or distance. Borchers understood this, and for that reason he thought of acts as figures of time and connection rather than space (1968, 173). He relied on graph theory and topology in order to ‘measure’ them, and lead him to conclude that ‘in an act, there is a potential kinetic energy’ (quoted by De la Cruz 2000, 137), hence his definition of architecture as ‘physics made flesh’ (1968, 173). We have, therefore, that both commodities (as values) and objects are imperceptible to our external senses, yet ‘perceptible’, in the case of objects, to our internal senses which perceive the ‘operational meaning’ Uexküll describes in his example. This is nothing more than the activation of our bodily memory, which immediately unfolds the required coordinated rules of movement, and even creating new rules if necessary, as when we learned to ride a bicycle with training wheels, and then to do it without them. With commodities qua values it is not that simple: for we only become aware of their retroactive power to regulate our social relations, when we exchange them in the market. Hence Marx’s notion of the fetishism of commodities which refers to the mystifying nature of the realm of exchange (the market) in which, as it were, the concrete social relations between producers become eclipsed and appear as properties of products themselves (Marx 2011, 83; Fine 2001). This raises the possibility that objects and acts, fundamental elements for architecture, have become commodified through time in such a way, that it is almost impossible to distinguish a non-commodified substratum within them. The regulated and coordinated movements we learn through our life are, of course, socially instituted and biologically grounded; hence, just like there is a socially necessary labour-time, which is concealed from us through exchange, there is a socially instituted conduct, which is represented by human acts hidden within all objects, including architectural objects. As soon as this twofold dimensions becomes intertwined, we have that architecture becomes just another ‘instrument’ for disciplining our motions to fit the pace of the law of value, which seeks to diminish labour-time as much as possible and so shorten the cycle of production and expansion of itself. As we mentioned, this is not exclusively to labour activities, but we will see how a wider definition of the notion of production allows us to see how all human activities are implicated directly or indirectly in the social production of value. The path we have followed in these three chapters has taken us through a progressive unfolding of many concepts. We begun with the contradiction and organic unity between nature and man, in which we defined the passive body as organically linked to the former, and the labour of the active body as the possibility for overcoming this contradiction through the human world created by architecture. Then we move into defining the specific order on which architecture is grounded, distinguishing things from objects within a biological and phenomenological approach. Finally, we focused on the realm of productive human activity to understand the basis of the relationship between human acts and value. In the following chapters we will expand on these issues from a historical point of view which will seek to explain the nature and fate of architecture under capitalist societies, and the possibilities for radical transformations. This title is taken from Section 3, Chapter 3 of Jorge de la Cruz’s Master dissertation (De la Cruz 2000, 148). We must bear in mind that Borchers uses a specific definition of will taken mostly from Schopenhauer and his critique of the causality between will and action, which he claim were one and the same thing. See: (Cartwright 2005, 181-182; 15-17), and (Schopenhauer 1969, 100). Adorno, Theodor. 1997. “Functionalism Today.” In Rethinking Architecture: A Reader in Cultural Theory, edited by Neil Leach, 4-18. London: Routledge. Borchers, Juan. 1968. Institución Arquitectónica. Translated by Patricio De Stefani for academic purposes. Santiago: Andrés Bello. —. 1975. Meta-Arquitectura. Translated by Patricio De Stefani for academic purposes. Santiago: Mathesis. Cartwright, David. 2005. Historical Dictionary of Schopenhauer’s Philosophy. Oxford: Scarecrow Press, Inc.
Cruz, Alberto. 2005. El Acto Arquitectónico. Valparaíso: Ediciones Universitarias de Valparaíso / Ediciones e[ad]. De la Cruz, Jorge. 2000. “Alquimia: El Acto y el Número.” Master diss., Pontificia Universidad Católica de Chile, Translated by Patricio De Stefani for academic purposes. Fine, Ben. 2001. “Commodity Fetishism.” In Dictionary of Marxist Thought, edited by Tom Bottomore, 102. Oxford: Blackwell Publishers. Heidegger, Martin. 2001. Being and Time. Translated by John Macquarrie and Edward Robinson. Oxford: Blackwell Publishers. Jameson, Fredric. 2011. Representing Capital: A Reading of Volume One. London: Verso. Lefebvre, Henri. 1991. The Production of Space. Oxford: Blackwell Publishing Ltd.
—. 2011. Capital: A Critique of Political Economy (Volume I). Translated by Samuel Moore and Edward Aveling. Mineola, NY: Dover Publications Inc.
Mohun, Simon. 2001. “Division of Labour.” En Dictionary of Marxist Thought, editado por Tom Bottomore, 153-156. Oxford: Blackwell Publishers. Ollman, Bertell. 1993. Dialectical Investigations. London: Routledge. Pérez Oyarzun, Fernando. 1997. “Ortodossia-eterodossia: Architettura moderna in Cile.” Casabella 650: 8-15. —. 2010. “Theory and Practice of Domestic Space between 1950 and 2000.” In Chilean Modern Architecture since 1950, edited by Malcolm Quantrill, 1-43. College Station, TX: Texas A&M University Press. Schopenhauer, Arthur. 1969. The World as Will and Representation (Volumen I). Translated by E. F. J. Payne. New York: Dover Publications Inc.
Sohn-Rethel, Alfred. 1978. Intellectual and Manual Labour: A Critique of Epistemology. London: The Macmillan Press Ltd.
Stanek, Lukasz. 2008. “Space as concrete abstraction: Hegel, Marx, and modern urbanism in Henri Lefebvre.” In Space, Difference, Everyday Life: Reading Henri Lefebvre, edited by Kanishka Goonewardena, Stefan Kipfer, Richard Milgrom and Christian Schmid, 62-79. Abingdon: Routledge. Tschumi, Bernard. 1996. “Space and Events.” In Architecture and Disjunction, 138-151. London: MIT Press. —. 1994. The Manhattan Transcripts. New York: Academy Editions. Uexküll, Jakob von. 2010. A Foray into the Worlds of Animals and Humans: With A Theory of Meaning. Translated by Joseph D. O’Neill. Minneapolis, MN: University of Minnesota Press. —. 1957. “A Stroll Through the Worlds of Animals and Men: A Picture Book of Invisible Worlds.” In Instinctive Behaviour: The Development of a Modern Concept, edited by Claire H. Schiller, 5-80. New York: International Universities Press. —. n. d. Cartas Biológicas a una Dama. Originally published as “Biologische Briefe an eine Dame” (Belin: Verlag von Gebrüder Paetel, 1920). Translated by Patricio De Stefani for academic purposes. Santiago: Zig-Zag. Van der Laan, Hans. 1983. Architectonic Space: Fithteen Lessons on the Disposition of the Human Habitat. Leiden: E. J. Brill. Weber, Andreas. 2004. “Mimesis and Metaphor: The biosemiotic generation of meaning in Cassirer and Uexküll.” Sign Systems Studies 32.1/2: 297-307. Accessed May 24, 2012. http://www.ut.ee/SOSE/sss/pdf/weber_3212. This entry was posted in Thesis Essays and tagged abstract labour, abstraction, architectural object, Architecture, commodities, Commodity Fetishism, concrete abstraction, concrete labour, exchange, Functionalism, human acts, labour, labour process, Marx, Phenomenology, production, pure architectural theory, real abstraction, socially necessary labour-time, the object, use-value, useful labour, value. Bookmark the permalink. Thanks for your comment Gaia. Regarding methodology you can see it as either a “theoretical issue” concerning the way in which you intend to use a given theory or theoretical frame, or as a more “practical concern” on how you intend to answer, concretely, your research questions (where to get the sources, references, etc). As you can see I tend to privilege the first one as I think it more relevant for any research, namely, what is the theory or theories you use to analyse any given reality (a building, a city, a system, a class, etc). Your mentions of the modern/postmodern dichotomy reminds me of Tafuri, it might be useful to you to read some of his chapters on his book “Theories and History of Architecture” if you haven’t read them yet. These are kind of “methodological” chapters towards the end of the book: “Intruments of criticism” and “The tasks of criticism”. Some accuse Tafuri of being a political “semiologist”, but given your intention to analyse building as language systems it may work well for you. Just out of curiosity, have you studied architecture before? I have, and I am trying to give a case-study approach, as I gather you are with multiple ones. How has this choice come in first place, and would you have envisaged any other (mixed) method? Which criteria have you chosen for their choice? I am asking about other methods, as I am kind of OK with the theory assumptions I am starting from, but still find it hard to detach from the contextuality when it comes to implementing the research to data gathering…and I think the case study path is the most appropriate, but might be wrong, for architectural research. My current faculty is of social sciences (Built Environment) so it would be good to have a more specific insight from researchers in a faculty of Architecture, and possibly combine both views. I did studied architecture before. I think you’re right regarding the case studies. From the start I agreed with my supervisor in focusing the research in one or two case studies that were buildings or projects instead of urban developments and the like, namely centred on architecture rather than urbanism. I think that help me a lot not to get caught in urban issues which would have been a bit crazy to complete in just a year research. I’m currently working with two case studies. My criteria for selecting them was a combination of several factors. At first, when I was more inclined to study the relations between architecture and capitalism in general, I had to make a decision whether to study the kind of commercial architecture most ‘representative’ of it (architecture which is directly implied in the reproduction of capital: factories, assembly lines, shopping malls, suburban sprawls, etc); or architectures which attempted to challenge the former in the past, namely ‘revolutionary’ architectures (russian constructivism, modernism to some extent, utopias from the sixties, etc.). I decided for the second choice which gave a turn in the research from ‘architecture and capitalism’ to ‘revolutionary architecture’. Then, I went on selecting three historical periods relevant for this aim: 1) mid-eighteenth century neoclassicism as the architecture of the bourgeois revolution; 2) 1920s soviet architecture; and 3) 1960s radical utopias. At the school professors recommended me to further narrow this periods to a particular practice, architect, project, or building, which I finally did in order to match the scope of the research with the time I have to complete it. Finally I manage to match this selection with my theoretical concerns. The first concern was with choosing not only a particular building but also a non-built project, as I want to look at the dialectic between project and work. My second concern derives from the central relevance which I’m giving to PRACTICE (especially in the third part of the thesis) as as see it as the locus for understanding the contradictions between theory and history within academia and, especially, the profession. As source for this I’m drawing heavily on Marx and Engels theories, particularly, Marx’s early writings and later developments in historical materialism. From these, I divided my concerns in two main fields: 1) the economic ‘material’ base or structure, which I link to the built work of architecture and intend to do a ‘political economy of architecture’ (to analyse the work from the standpoint of material practice: labour); and 2) the ideological or ‘mental’ superstructure, which I relate to the non-built project of architecture, in which all the mystification and distortions of the discipline are in way condensed. As my interest in the issue of the real and material practice of architecture grew, I moved from just studying the relationships between architecture and bourgeois society to study ‘the possibility of a emancipatory architectural practice’ and not a simply a ‘revolutionary or emancipatory architecture’ (which as you can see poses the problem of finding yourself believing that there can be such a thing in-itself, divorced from social relations). The first case is a Chilean building, UNCTAD III was built in 1971-72 in Chile, during the socialist government of Salvador Allende, for the third UN International Conference. From being turned into a military headquarters to being destroyed by a fire and then reconstructed, this building passed through the major political and economical transformation of Chile since the 1970s, from a socialist project to a military-economic dictatorship, and finally ‘democracy’. The second case is an Italian utopian project, No-Stop City was the most important project of Archizoom Associati, based in Italy during the late 1960s. It was a radical utopian design for a city in which capitalism and the market are omnipresent, and architecture has been superseded by a homogeneous ‘climatic universal system’. Archizoom expected that by showing in the clearest way possible the alienating conditions of the capitalist city without the mystification of architectural representation, humanity would be totally absorbed under the control of market forces and this, paradoxically, would allow the free appropriation of the city and the overcoming of bourgeois society. Described often as a ‘negative’ or ‘critical’ utopia, the project is strongly influenced by the revolts of 1968 and the Operaismo Marxist movement. Most of the data I have gather for these cases is coming from journals from epoch, from archives, interviews to architects, etc. I personally known the Chilean building though. I will probably travel to Firenze but I’m afraid not as part of the research (not have enough time) but I have a Chilean friend working there. You could ask ‘why not more contemporary cases?’. There are two reasons. Even if my concern is with current architectural practice and its all too willingness to accept and even encourage dominant capitalist practices, I think (and this is a historical hypothesis) that we can find the bases of the kind of architecture we see nowadays in the world in what happened in those crucial decades between the late 1960s and the early 1970s (much in the same way that Michel Foucault sees the basis of postmodern society in the eighteenth century, or Marx sees the most ’embryonic’ form of capitalism in the rising of the bourgeoisie around the same time). The second reason is empirical, namely, can you see around some relevant current examples of architecture challenging the status quo? Seems highly unlikely, as I think that the last breadth of revolutionary fervour was in 1968. But with the current global economic and fiscal crisis in mind, you never know what’s going to happen next, especially in Europe. Sorry for the long answer, but as you can see, I took the long path starting form very broad cases and then narrowing down always keeping in mind the connections with theory. I guess that the key issue is to pay attention to this interplay between the concrete and the abstract, or between the particular cases you are looking, and the more abstract theoretical concerns you are pursuing. You can find chapter two in “Lotus International, 46, April 1985, pages 36-45”. Both articles are very interesting and address directly the different ways in which architects have thought how to intervene in the existent city and architectural heritage throughout history. Thanks for the help you offered, you can contact me any time or send me your email through a message to the facebook page. I’m sure everything is going to work well with your research as I see you’re very much into it, which is always good. 😉 cheers!